Charlie N. Holmberg is one of the freshest voices writing in fantasy today. Holmberg’s latest book, Magic Bitter, Magic Sweet, is somehow both uniquely different and eminently familiar at the same time. Maire has no memory of who she is or where she comes from. She is in a small village with kind people who have become her friends when the village is raided and many of the people killed. Maire survives to be taken prisoner and auctioned off as a slave. A strange man named Allemas sees something in or about her and buys her immediately. He takes her to his home, enslaving her, and forcing her to … bake for him. What Allemas seemed to know or recognize about her, that she slowly comes to understand, is that she has the power to infuse her baking with magic, giving those who eat her cakes and cookies and treats, the power of the magic. If she doesn’t concentrate on the correct thing, though, she might give the wrong magic (for instance, anger instead of knowledge). Meanwhile, during her captivity, Maire is visited by a vision … or is it a real person? … who seems to know her from a time before she lost her memory. But this vision, Fyel, doesn’t give her too much information, though with each visit she remembers just a little more about herself. Yet the captivity takes more and more out of her and she may not survive long enough to understand who Fyel is and her relationship to him. Just as I found with Holmberg’s “Paper Magician” series (review still to come), I find her writing so crisp and tight, and her characters are really strong but with an air of mystery surrounding them, making us want to read more, not just for the story, but to learn more about the people in the story. There are surprises here … a few things that caught me off guard but that made me smile and start to anticipate something a little different and wondering how Holmberg would weave the fabric of this story together. There are also a few moments that get just a little bit long and a little bit repetitive. These latter are few, but I mention it because it is the only reason I don’t give this a flat-out 5 star rating (though my rating will round up to 5 stars on most sites). The Goodreads site doesn’t identify this as the first in a series, but it is pretty clear that there is much more to come. I highly recommend this book for anyone interested in modern fantasy. Looking for a good book? 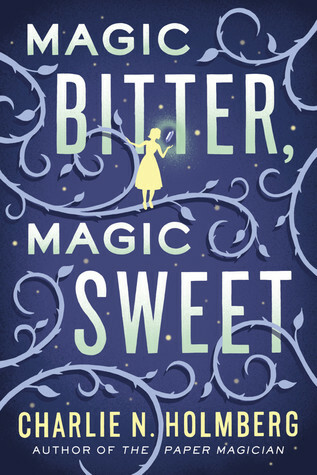 Magic Bitter, Magic Sweet by Charlie N. Holmberg is a well-crafted, well-written fantasy that is a ‘must’ read for anyone who like the genre.